Centered in the town of Odyssey, the story starts when a backpack filled with money is found in Gower's Field. Then a plane crashes outside town and a mysterious survivor is discovered who may be an undercover agent or part of a counterfeit ring—or something else altogether! Enter an underworld errand-boy who has a cell-phone full of secrets. And that's just the beginning of The Green Ring Conspiracy, a special adventure that puts our favorite Odyssey characters at the center of intrigue, suspense, and a scheme of international proportions. New friends may not be who they seem. Old friends have secrets they must keep. Deception and double-crosses are the order of the day. Trust, loyalty, and faith are all put to the test. 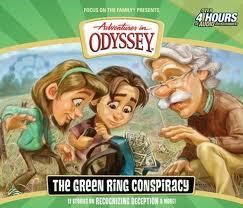 The Green Ring Conspiracy is unlike any collection of stories found in Odyssey, yet still brings together the drama, fun, humor, and life-lessons audiences have come to expect from the show over the years.